Over ten years ago, I heard the Lord speak to me with instructions to get healthy. My husband, Bill, and I had been pastoring our church in Redding, California and we were seeing God move in great and powerful ways. Spiritually, I was in a good place; but physically, I had a long ways to go. 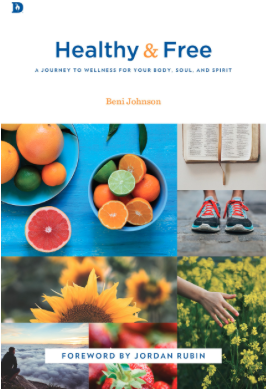 Over the course of my journey towards health, The Lord began to reveal to me that health is not just for our bodies, but also is intended for our soul and spirit. God created us as a triune being and His will is to see us flourishing in all three areas. Before we explore what Soul health looks like, allow me to first differentiate the difference between our spirits and our souls. An in-depth study of the Greek words for ‘soul’ and ‘spirit’ suggests that they are similar – in fact, almost identical. However, I found this definition that helped to clarify the difference for me, ‘The soul is the essential life of man ‘looking earthward’ and the spirit is that same principle of life breathed (like wind) into man from God that can look towards and experience God’. This suggests that the spirit and the soul have different emphases. For the sake of avoiding confusion, I am going to refer to the soul (the part of us that looks earthward) as the mind. I love this verse because it so beautifully gives us an important key in living a healthy life. It shows us that we must align our minds and our thoughts with God. In order to love our neighbors well, we must love ourselves well. The connection of loving God, loving ourselves, and then being able to show that love to others so beautifully shows how God intended for us to live. For many of us, learning to love ourselves may feel difficult or even impossible at times! But I promise you that once you begin the process of falling in love with yourself, you will find more freedom and joy in Christ with each passing day. Aside from finding a new level in freedom in Christ, having a healthy mind has also been proven to have a positive effect on your physically bodies as well! As I mentioned earlier, our beings (spirit, soul, and body) are all wonderfully connected. Respected brain specialist, Dr. Caroline Leaf, in her book Who Switched Off My Brain, states that, ‘Toxic thoughts are thoughts that trigger negative and anxious emotions, which produce biochemical, that cause the body stress. They are stored in your mind as well as in the cells in your body.’ It’s time to take these toxic thoughts and replace them with loving ones that will bring us healing. In addition to declarations, another way to combat lies that you might believe about yourself is to laugh at them. I want to encourage you to do just that. That’s right. Laugh at them. I know a pastor who strongly believes in this practice, and will actually put people in a circle, and have each one share with the group a lie that they believe about themselves. As they confess the lie, the whole group begins to laugh. It’s a powerful form of ministry because laughter dismantles the lie’s power in such a fun way – it reveals the truth, and brings perspective. In 2 Corinthians 10:5, Paul instructs us to “take captive every thought to make it obedient to Christ.” Some of us may have spent years, even decades, living with unhealthy and self-loathing thoughts so much so that you may not even realize that you are having those thoughts! The next step is to ask the Holy Spirit to show you when you are having negative thoughts about yourself, another person, or a situation. When you take that thought captive, replace the thought with how God sees you or the situation. As with any new change, always allow yourself Grace. Creating a healthy soul is a journey and a process that will not happen overnight. Embrace the process! Enjoy the journey that you and the Holy Spirit are embarking on!